Acumatica Summit 2019 offers a multitude of tangible benefits. Acumatica’s Angela Boomer addresses a few today, including a new hands-on training track for Acumatica Construction Edition. She assures you’ll leave with the knowledge you need to get the full ROI from your cloud ERP software investment. I’m new to the Acumatica team, but I had the pleasure of attending Acumatica’s annual cloud ERP event last year in Nashville, Tennessee as an attendee. Now, as the Director, Product Management for Acumatica Construction Edition, I get to help plan the Construction Edition training and breakout sessions during Acumatica Summit 2019 (taking place January 27-February 1, 2019 in Houston, Texas at the beautiful Marriott Marquis Houston). As both a past attendee and current planner of this event, I can attest to the fact that it’s worth the time, cost, and effort you put into it. As such, I encourage you to not only register but to do so right away for two reasons: 1) our special early bird pricing is still in effect and 2) this is a do-not-miss opportunity to have hands-on training that delivers deep insight and knowledge into the cloud ERP software you use every day. And these sessions are popular, so you’ll want to reserve your spot in advance. As I mentioned, I attended last year’s Summit. I participated in the Project Accounting training and found it to be an extremely valuable experience. We were given mass amounts of information, which included being introduced to cost codes, change orders, and the new, modern UI—which I personally found to be more intuitive and easier to navigate as a new-at-the-time Acumatica user. Even though Acumatica Construction Edition is Acumatica’s newest application, it, too, benefitted from the enhancements brought by the release of Acumatica 2018 R2. Acumatica Summit 2019 attendees will learn about these improvements, including enhancements to the Procore integration for managing field operations through real-time access, upgrades to Requests for Information (RFIs) processes, and much more. I participated in similar conferences when I was in a previous position with a different ERP vendor. I can say, without a doubt, that Acumatica’s Summits are light years ahead, especially in terms of their training tracks. The training tracks at these other events would require hundreds of computers to be set up prior to the attendees’ arrival and every year, there were issues that would grind the training to a halt. 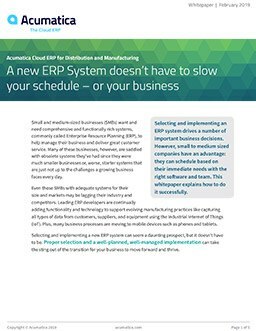 With Acumatica, users bring their own laptops and download the cloud ERP software. The training commences without a hitch, users have the access they need, and any last-minute updates are handled easily. A win-win for everybody involved. The hands-on training tracks are a key reason to register, but I’d be remiss in not mentioning a few other Acumatica Summit 2019 benefits. During the event, the Acumatica leadership team will present live demonstrations showcasing new product releases as well as share our future product roadmap. On tap for this year is a look at the upgrades Acumatica’s latest release made to not only our Acumatica Construction Edition, but also to our Financial Management, Distribution, Field Service, Commerce, Manufacturing, Project Accounting, and CRM editions. In addition, there will be sessions where current customers and partners show the benefits they’ve experienced using emerging technologies (e.g. artificial intelligence (AI), machine learning, and more) through Acumatica cloud ERP. For example, last year there was a landscape company that explained they could now track the moisture content of their plants and soil via technology, eliminating the need for someone to do it manually. I was blown away. I can’t wait to see more real-world scenarios where Acumatica has made a profound difference in the way organizations do business. Another moment I enjoyed from last year (and see as a reason to attend the Summit) was the Keynote speaker, Carey Lohrenz. She did a fantastic job of inspiring us and giving us perspective outside of just learning about cloud ERP software. Her talk was educational and motivating. I’m looking forward to the Keynote speaker for Acumatica Summit 2019: Keep an eye out for the announcement coming soon! Finally, the Keynote, training, and breakout sessions, as well as the evening events, give Acumatica Summit 2019 attendees the perfect opportunities to network. If you doubt the benefits of getting to know others who use the same cloud ERP software, bouncing ideas off each other, and connecting at future conferences, then I hope you’ll reconsider. Building these relationships is extremely important; the information sharing will lead to insights you may otherwise have missed. Can you tell that I’m excited for Acumatica Summit 2019? I hope so, and I hope you’ll register today. And if you have any questions or feedback on our cloud ERP solution, please contact our team of experts. We want to hear from you.